I have many pieces of fabric that are soft and flowery, my favorite is anything with roses on it. I know somewhere in all my books that I have a book of romantic quilts, but I can't find it now. When I look at patterns in the magazines or in books, I don't find anything that will be romantic using this fabric. I bought 30 FQ's of Robyn Pandolph's line that is about 2 years old and it's just beautiful with yellow, green, blue and beige all in flowers. Of course, I know that you can cut these fabrics up and make anything you want. But I really want a really soft looking quilt that is romantic looking. This is for me, not for a gift. I just want a girly kind of quilt, I do hope someone understands what I would like. By the way wanna be, I think you have fabulous taste in fabric!! I love Robin's stuff too. Definitely look at something shabby chic. I think often large patterns with rectangle and square blocks are used displaying those beautiful rose prints without chopping them up too much. I made two shabby chic quilts for two of my DDs and used a super big la Moyne star set on point in the center of the quilt surrounded by 8 in. log cabins. I am not sure if I have a pict of any of them. I used Moda Martenique fabrics for that. Last edited by Annaquilts; 08-01-2013 at 01:40 PM. Maybe this has a pattern that sparks your interest. I love RPs' fabric. Roses are one of my favorites too. I think just using these fabrics with any pattern would look romantic. The fabric itself is romantic. one of my favorite patterns is Path Through the woods. I really like it because it can showcase beautiful fabric without cutting into small pieces. Just imagine RPs' roses surrounded by little "picket trellis' "
I'll try to post a pic! I love Robyn Pandolph's stuff too. You don't mention whether you'd be interested in applique... Here's a free pattern that I think would look soft and gorgeous in the colors you describe. How about crazy patch blocks, for that girly touch you could embellish simply as you go with edging laces, colour-matched ribbons - a lot, a little or not at all - but very feminine. 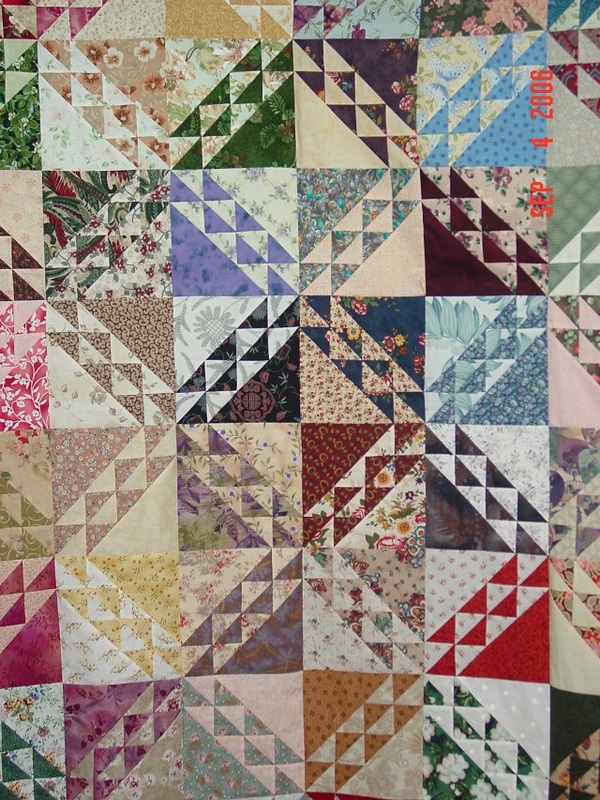 I so love shabby chic and crazy p/work, together make a glorious quilt. You will post a photo won't you? Funny How our minds work - the very first thing that popped into mine: Have you ever seen the movie, The Proposal with Sandra Bullock, Ryan Reynolds and Betty White? Remember the 'Baby Maker Quilt'? Yep that's the one that I thought of first for a romantic quilt lol.